The second set of invitations that I designed were for Jennifer and Christian who were married in the oldest Catholic church in Buffalo and celebrated their reception at Shea’s Theatre, a cultural landmark in downtown Buffalo. This suite was also letterpress printed with Studio on Fire on Canaletto Grana Grossa Bianco in a 111# cover weight. 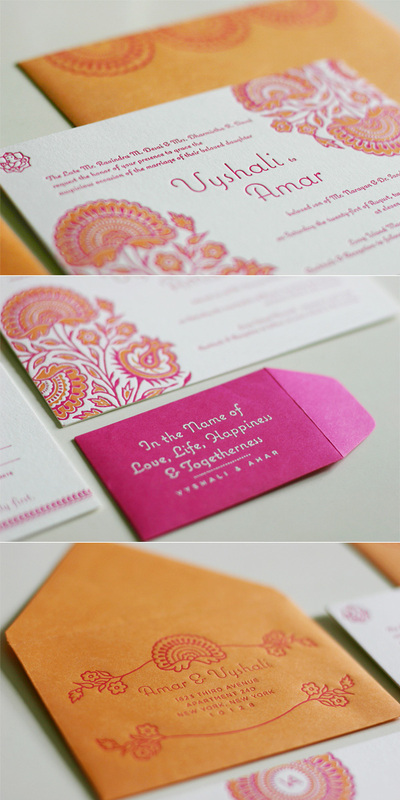 The invitations were square, featuring a vintage looking flourish. 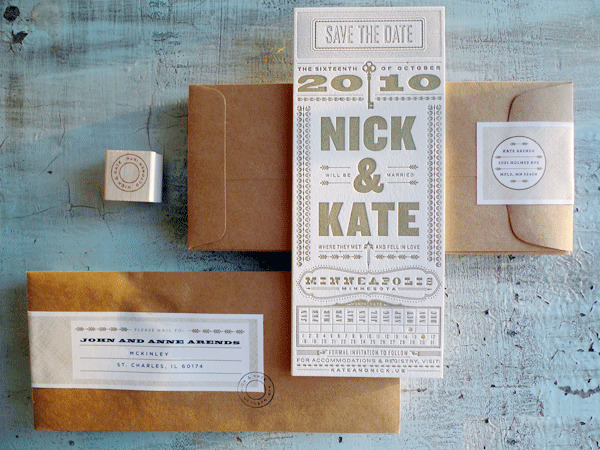 To play up the theatre aspect, the reception card was designed to look like a vintage ticket. (“Tale of Three Cities” alludes to the cities the couple has lived to together: Buffalo, Tokyo & New York City.) They were also enclosed in tiny red envelopes that were stamped with a calligraphed sentiment. The RSVP card was designed as a postcard and guests were invited to write a note or draw a picture on the backs of them for Jen and Chris to keep as a keepsake. They also featured a line from the couple’s first dance song, “Can’t Fight This Feeling”. The suite was mailed in a black envelope with the return address letterpressed in silver ink on the flap. (Not shown to protect the couple’s mailing address.) These were also lined with the song lyrics from their first dance song. Small ceremony program covers were also letter pressed at the same time as the invitation suite and were later bound with red and white twine. Detail shots from Jennifer & Christian's wedding invitation suite. All letterpress printing by Studio On Fire. I had the pleasure of designing wedding invitation suites for two sets of friends who tied the knot last weekend. The first set were for Vyshali & Amar who had a traditional Hindu wedding. These were letterpress printed by Studio on Fire on Cranes Lettra Pearl White in a 220# cover weight. The mini hot pink envelopes were rubber stamped with white embossing ink and held the directions and accommodations. The bride loves gerbera daisies but wanted to keep the feel of these traditional yet modern. We came up with this motif from searching through books of traditional Indian textile patterns and felt that this was what we were looking for and, in a funny way, looked like the daisies she loves so much. 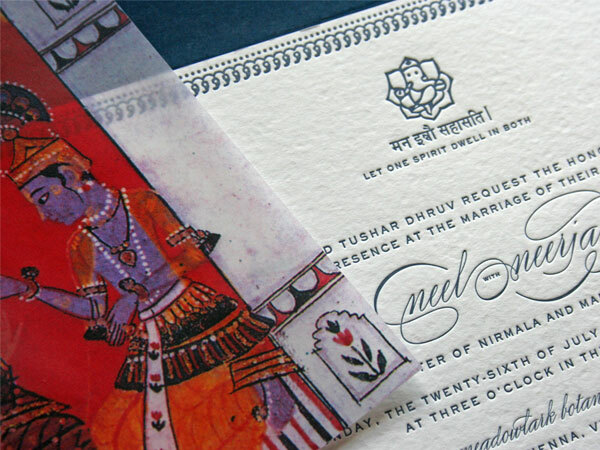 Detail shots from Vyshali & Amar's wedding invitation suite. All letterpress printing by Studio on Fire. Save the Date by Kate Arends. Printing by Studio on Fire. I saw the new designs for Bella Figura via Ellie of Mint today and loved what I saw. The new designs are from extremely talented designers such as Erin Jang, Jessica Hische, and Ellie herself! There are so many amazing additions… so hard to pick just one to show you! Be sure to see them all on the Bella Figura website. Ribbon by Erin Jang. Available at Bella Figura. Rustic & Gorgeous from The Perky Bros. I cannot get over the typography. I am absolutely floored by this wedding invitation set produced by the amazing Studio on Fire and designed by the super talented groom Jefferson Perky of Perky Bros. 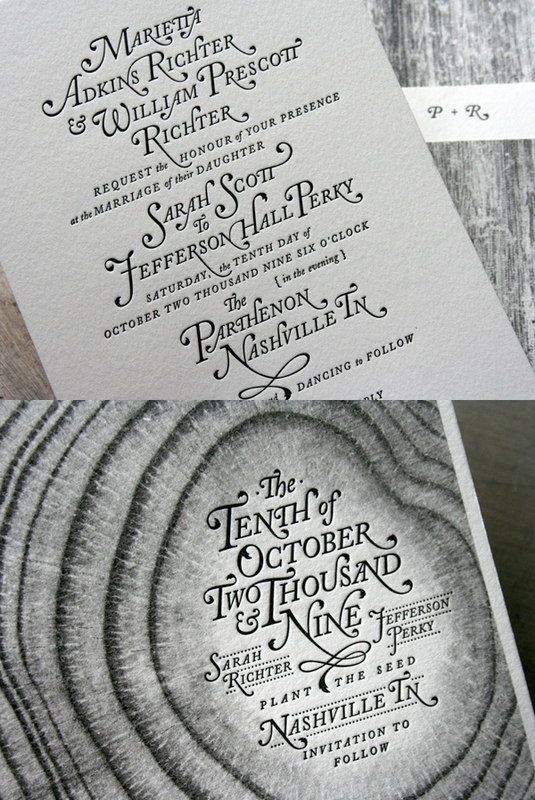 The invite was offset with the wood grain pattern and then the type was letter pressed. A save the date, invite, accommodations card, custom belly band and thank you card were produced. See more of this suite on Beast Pieces. 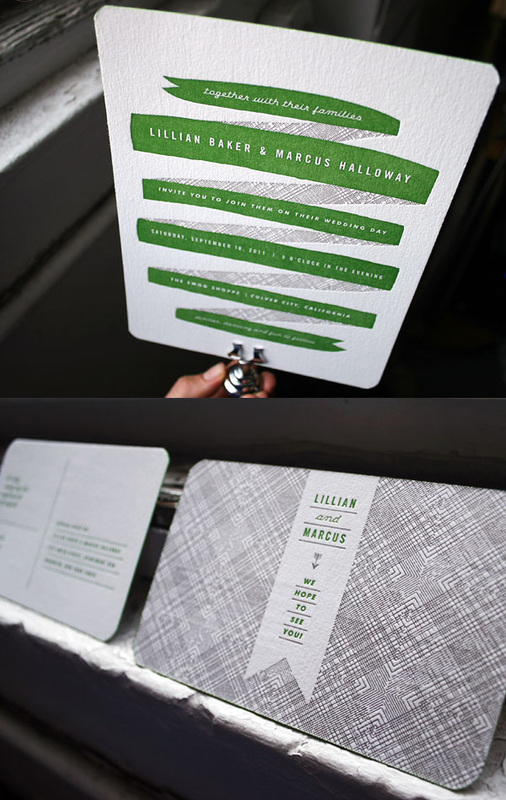 Wedding invitation by Perky Bros. and produced by Studio on Fire.